I recently got to check out a Model T Ford at a car show. What was surprising was that the controls have nothing to do with modern cars. It sort of drives like some kind of Steam Punk contraption: the throttle is on the steering column, while a set of pedals control forward, reverse, and braking. Model T drivers love the interface, and swear by it as a tough workhorse. So now, let’s have a look at the the best part: Apparently Ford after 1917 offered an all-terrain conversion kit, that when purchased would put your Model T on tank treads. Why can’t we do this today? In fact, could we go back to the controls 1.0 that the Model T offered? I think it would be lovely to roll around in early 20th Century contraptions fitted with tank treads, bombing across nearly any surface. Where did we go wrong? So not only did the Model T have quirky controls and an optional tank configuration, apparently, judging by the film clip, they were tough as hell just out of the factory. They rolled like iron mules across river beds, snow banks, mud, cliffs and any other obstruction. Maybe it was the narrow tires. Maybe it was the absolutely innocence of the drivers. 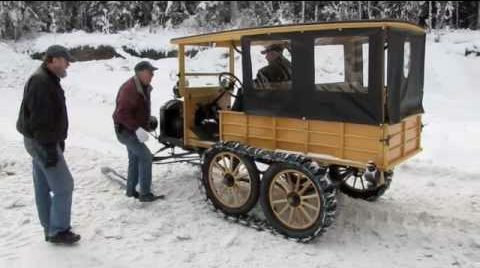 Maybe it’s time to introduce an all Model T off road competition. We might discover that no improvements were necessary, way back in 1904.